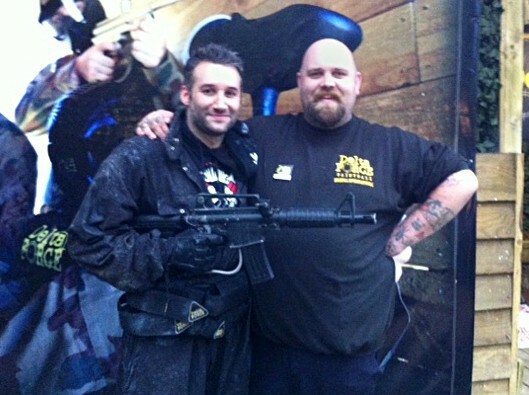 South Bristol paintballing – Dane Bowers takes it to Another Level! The one time boyfriend of model Katie Price (aka Jordan) was visiting the West Country city of Bristol along with a bunch of pals and, like many other Delta Force paintball players who flock to us every week, saw this as the perfect opportunity for some epic paintball action before a night out on the tiles! Dane and his friends really couldn’t have chosen a better Delta Force centre to visit. The South Bristol paintball centre has recently been recognised as the UK paintball centre of excellence for the 2013 summer season, a brilliant achievement considering it has only been open for just over a year! Delta Force Paintball South Bristol also managed to win the Customer Service Award for the same period. Featuring some of the most exciting mission scenarios, imaginative prop designs and immersive game zones, we can only see the South Bristol paintball centre increasing in popularity over time. Coupled with our equally outstanding North Bristol paintball centre and even a short trip over the Welsh border to the Cardiff centre, this part of the UK is a haven for fast-paced outdoor paintball. It was one particular game zone which earned the plaudits of Bowers and his fellow paintball comrades. The Apocalypse Bunker mission pits the living against the evil undead; Dane and 11 other pals manage to survive an onslaught of 85 zombies – Good effort lads!